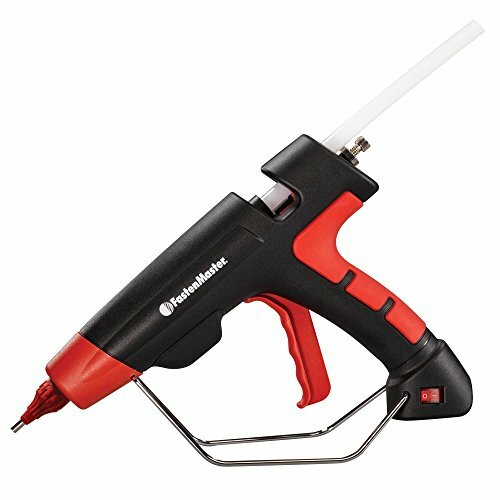 For this post, I have put together a collection of the best hot glue guns currently available. Note: there are two common sizes of glue sticks. The "full size" sticks are 0.44 in. diameter and should be used in compatible full size glue guns. "Mini size" sticks are 0.27 in. diameter and should only be used in mini size glue guns. The two glue stick sizes are not interchangeable. The full size glue guns deliver more adhesive volume per squeeze, so are more suited for larger jobs, while the mini size offer more precision on smaller tasks. The following hot glue guns use the latest innovative components to meet your needs and help to ensure you do your best work. So here is my list of The 10 Best Hot Glue Guns. 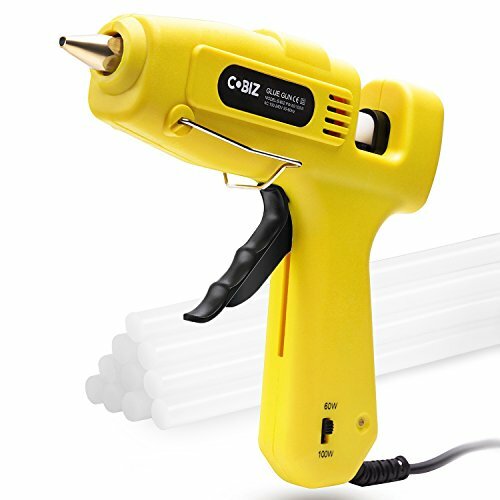 The Cobiz Full Size Hot Glue Gun with dual power switch. Select 60w for small projects or 100w for large projects. 60W for thinner and cooler slow running hot glue stream for a fine work. 100W for a stronger quicker bond. Stable stand allows you put it aside and pick up safely. Premium copper nozzle rather than aluminum gives you continuous and fully melted glue. Smart temperature control which prevents overheating. The CCBetter Mini Size Hot Glue Gun is an easy to use adhesive tool not only for DIY crafting but also for quick daily repairs. High-quality gun nozzle produces a smooth flow of glue. Includes stable stand to allow setting aside while working. Convenient on / off switch. Compact design for a wide range of uses. 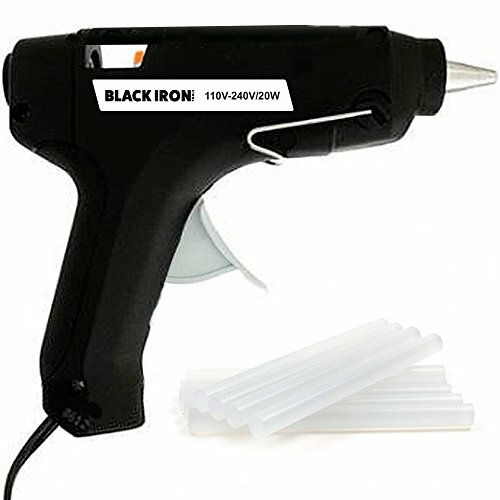 The Adhesive Technologies Full Size Hot Glue Gun is an Industrial-Grade tool with an output of 3.5 lbs of glue per hour that is perfect for light-industrial, commercial and DIY applications. Features a 200 Watt PTC Heating System. Quick 3-minute warm up time. Sturdy base stand and a high-quality shell. Don't forget the glue sticks. The Attican Mini Hot Glue Gun us a heavy duty kit that is perfect for both beginners and art and crafts professionals. Works great for fabric and other craft materials. 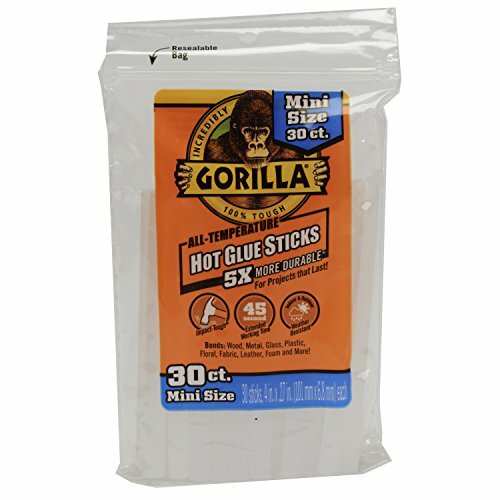 Uses 5/16" (mini size) diameter glue sticks. Includes 15 melt glue sticks. 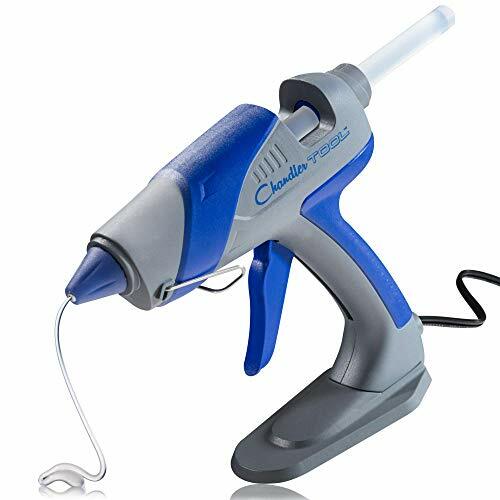 The Chandler Tool Full Size Hot Glue Gun combines the reliability and performance of an industrial hot glue gun in a versatile and compact design. Includes patented “Stand-Up” base to reduce the chance of tipping. Traditional wire stand is also included. Great for everything from crafting to home repairs and DIY projects. 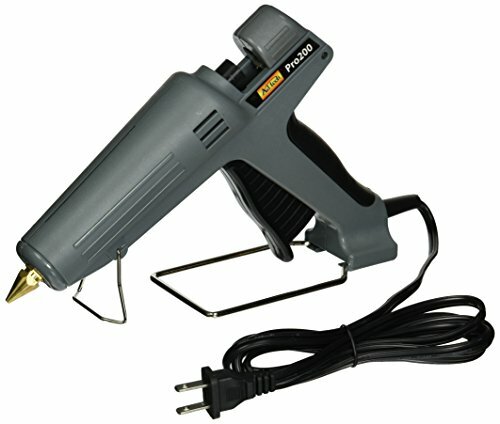 The Pam HB220 Full Size Hot Glue Gun is a professional grade adhesive system designed for all day use in a variety of flooring installation, remodeling, and repair applications. Pro Applicator combines an adjustable high temperature range with a powerful 220 Watt heating element that keeps up with heavy all day usage. No drip, no mess nozzle. Fast activation under 5 minutes. Designed for 1/2" glue sticks. 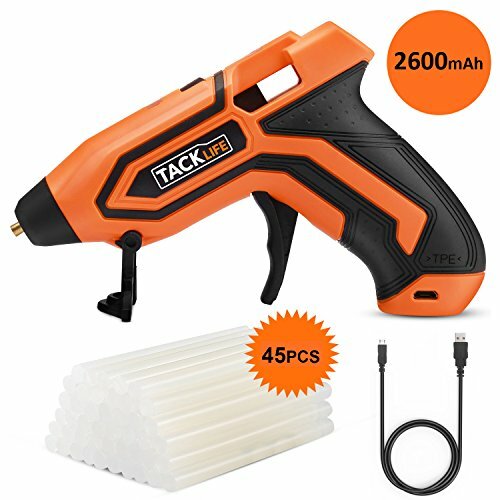 The Tacklife Cordless Mini Size Hot Glue Gun provides the ultimate in flexibility with up to 35 mins per charge. Equipped with 2600mAh reachargeable Li-ion Battery. Designed with the battery and temperature indicators. The portable design makes it fit for one hand controlling and ergonomic handle and lengthened trigger design for convenient carrying. Includes 90cm USB cable for convenient charging. Designed with high quality and insulated copper nozzle. 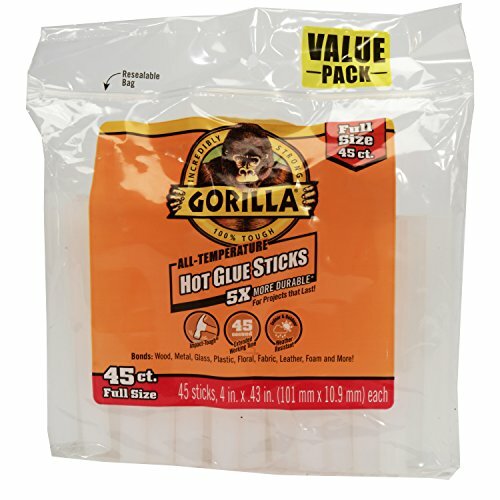 Includes 45 glue sticks for quick use right out of box. 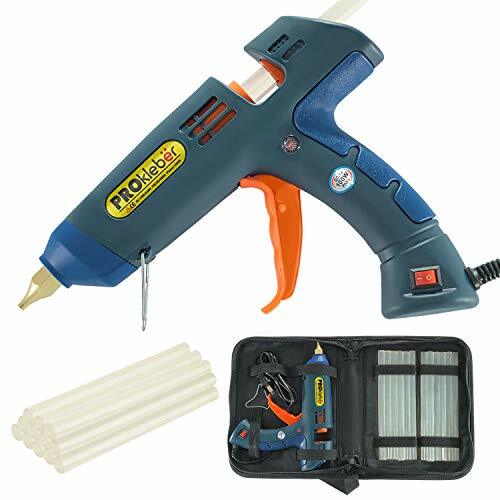 The PROkleber Full Size Hot Glue Gun can be used for a range of different materials including wood, metal, plastic, glass, ceramic, rubber, leather, textile, fabric and paper. Working Temperature: 356 to 392℉. Includes 12 dry glue sticks and storage case. 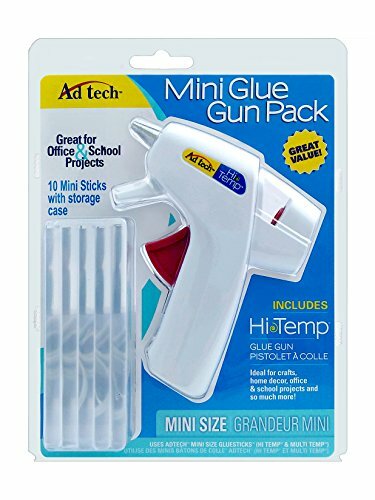 The Adhesive Technologies Mini Size Hot Glue Gun is great for those small craft and home repair projects that don't require a lot of time or glue. Perfect for crafts, school projects, small DIY projects and more. Bonds in less than 30 seconds. Features a long 5ft electrical cord. 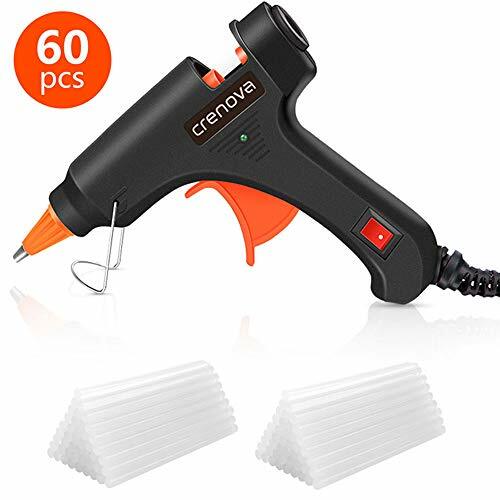 The CRENOVA Mini Size Hot Glue Gun heats up rapidly within 3-5 minutes, to help you to work efficiently. PTC heating component and built-in fuse ensures that you can work with it safely. Keeps constant temperature and prevents over heating. Trigger propulsion design to easily control the glue flow. Sized for convenient one-handed use. Removable stand support, to keep it stable and upright. 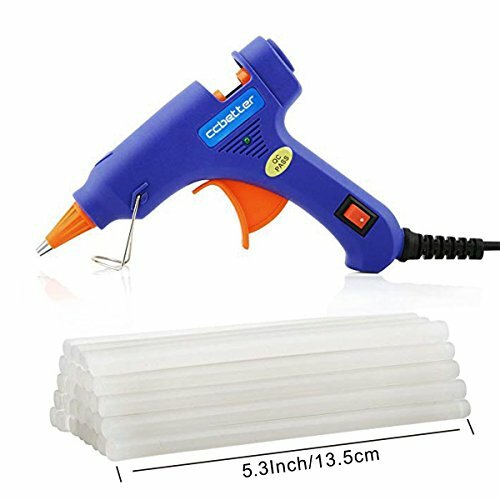 I hope this list of the best hot glue guns was helpful.